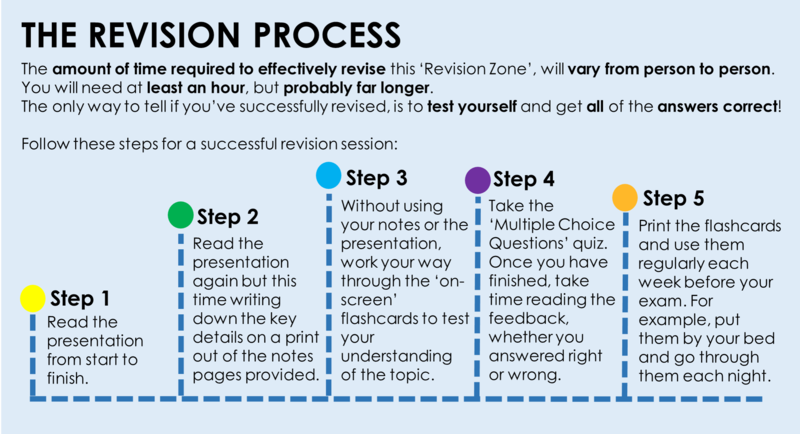 This revision zone looks at the ‘Hexadecimal Number System’. Begin the revision process by reading the presentation below or watching the… VIDEO LESSON! Download the handouts pages and make your own notes about each slide. [q]What is a major drawback of writing binary numbers? [q]What is the hexadecimal number system? Therefore the number 101 in hexadecimal is 257. …but in all number systems, placing two digits in one column is not allowed. How does the hexadecimal number system overcome this? [a]The hexadecimal number system uses letters to represent 10, 11, 12, 13, 14 and 15. [q]What is the hexadecimal number 13 in denary? [q]What is the hexadecimal number 47 in denary? [q]What is the hexadecimal number A1 in denary? [q]What is the hexadecimal number AB in denary? [q]What is the hexadecimal number 9D in denary? [q]What is the denary number 50 converted into hexadecimal? [q]What is the denary number 172 converted into hexadecimal? [q]What is the denary number 101 converted into hexadecimal? [q]What is the denary number 68 converted into hexadecimal? 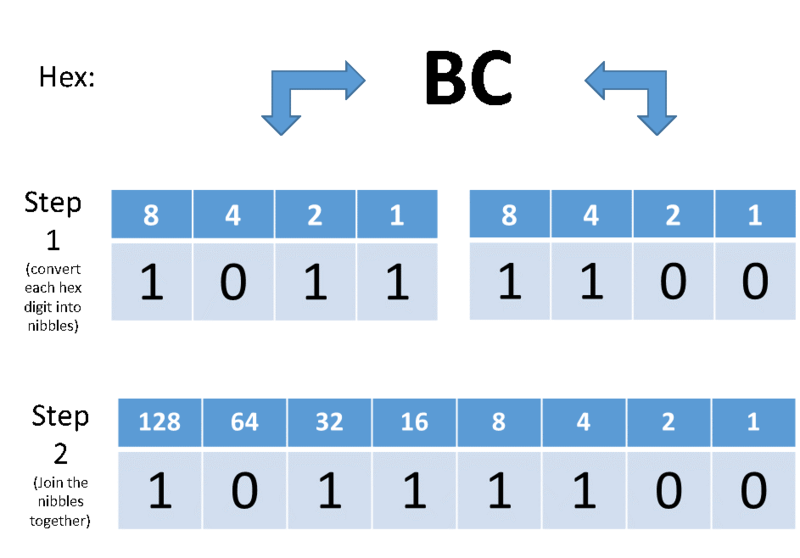 One reasons is that Hexadecimal uses fewer digits to represent values compared to binary – but so do denary numbers!? So why do computer scientists use Hexadecimal? [a]It is because it is easy to convert between Hex and Binary! [q]How do you convert a binary number into hexadecimal? – join the separate values to form the hexadecimal number. [q]Convert the binary number 10000011 into hexadecimal? [q]Convert the binary number 11111001 into hexadecimal? [q]Convert the binary number 11010111 into hexadecimal? [q]Convert the binary number 11101010 into hexadecimal? [q]Convert the hexadecimal number BC into binary? [q]Convert the hexadecimal number 4B into binary? [q]Convert the hexadecimal number 2F into binary? [q]Convert the hexadecimal number 7A into binary? 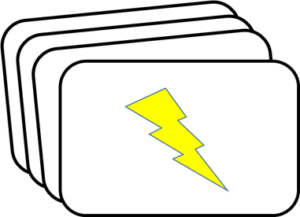 Download and print out these ‘Flash Cards’ – use them to reinforce your understanding! Ensure you print these double sided, ‘flipped on short edge’ so that the front and back of each card match up! Take the test to assess your knowledge and understanding of the hexadecimal number system. …and relax! Check your answers, learn from your mistakes and re-revise any areas still causing concern. What is the value of the hexadecimal number 16, in denary? What is the value of B in hexadecimal? Remember, in hexadecimal, you count up to 15 in each column. But, you can’t have more than one digit in a column, so in hexadecimal, we use the letter A for 10, B for 11, C for 12, D for 13, E for 14 and F for 15. What is the hex value of B4 in denary? What is the denary value of 14 in Hexadecimal? What is the denary value of 51 in Hexadecimal? 51 is made up of 3 lots of 16, with a remainder of 3. So, 51 is 33 in hexadecimal. 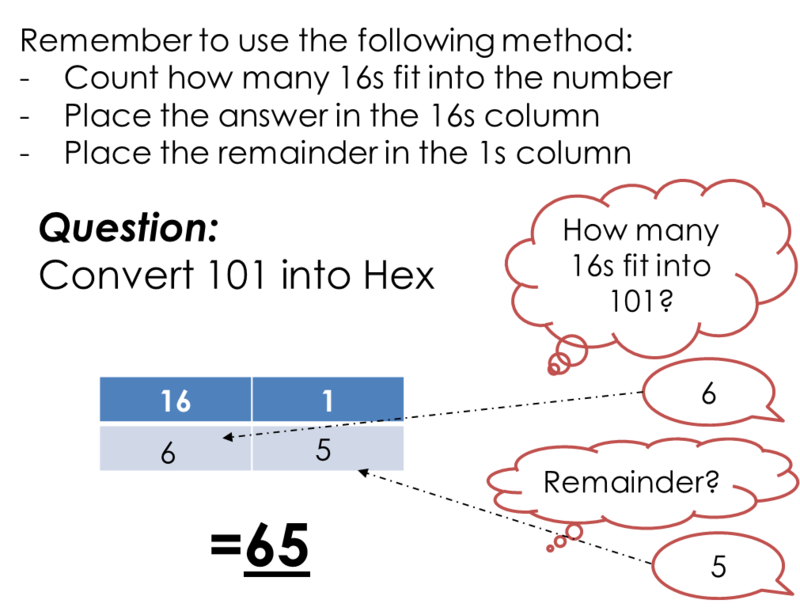 Remember, when converting from denary to hex, see how many times 16 fits into the number first (this answer will go in your first column) then see what the remainder is (this answer will go in your second column). What is the denary value 164 in Hexadecimal? The tip here is to recognise that 164 is close to 160, which of course is 10 lots of 16. So you can immediately notice that 16 fits into 164, 10 times. Then finding the remainder is easy…it is just 4. What is 1100 + 1100? What is 11001101 + 10001111? What is the problem with the obtaining a 9 bit answer from the addition of two bytes? The addition won't work in binary. The addition results in too many bits for the hard drive to store. 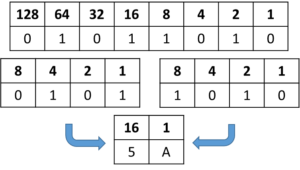 The addition results in an overflow error. The addition produces erroneous results. Remember, traditionally 8bit CPUs had registers that could only hold 8 bit binary numbers, so when 9 bit binary numbers were calculated, they couldn’t handle the extra bit and so an overflow error resulted. Take this test to assess your knowledge and understanding of hexadecimal and binary conversions. Aaand relax, its over! Now take a look at your result and spend further time revising any areas of the test that you got incorrect. 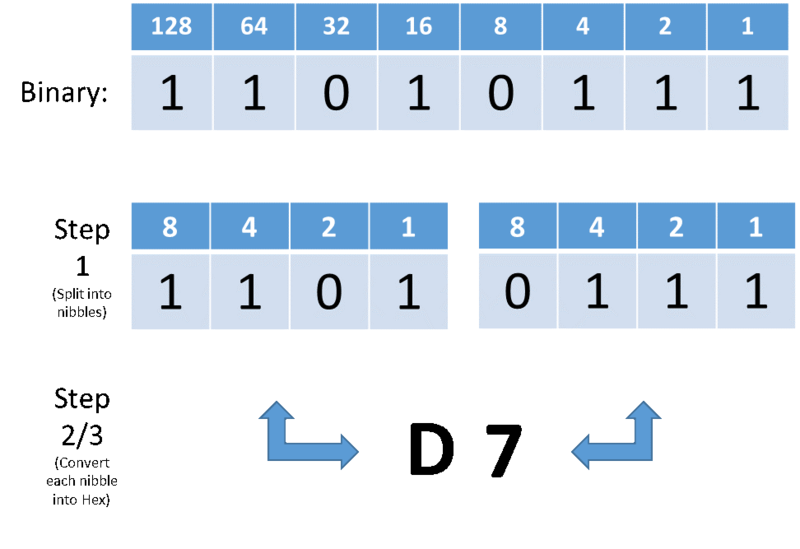 What is the ‘BASE’ of the binary number system? What is the ‘BASE’ of the hexadecimal number system? 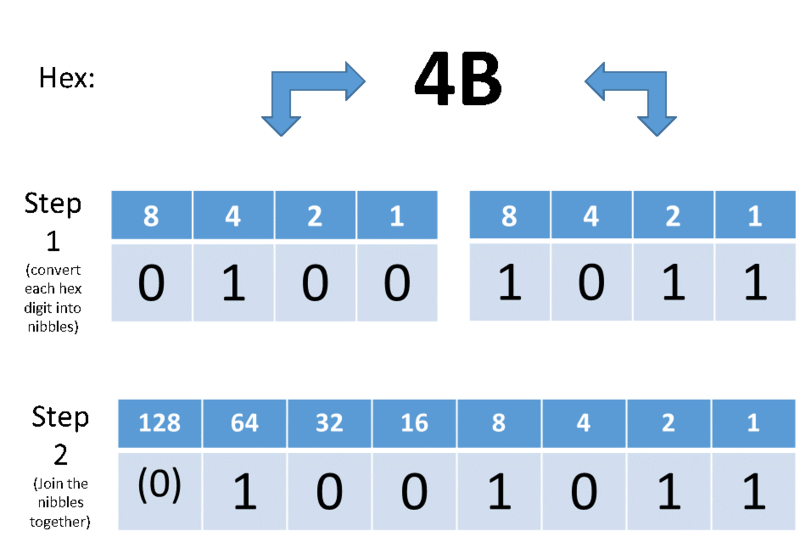 What is the Hex number ‘A’, in binary? Remember, in hexadecimal, you count up to 15 in each column. But, you can’t have more than on digit in a column, so in hexadecimal, we use the letter A for 10, B for 11, C for 12, D for 13, E for 14 and F for 15. Then you need to convert your denary number to binary, so 10 becomes 1010, as its 1 lot of 8 plus 1 lot of 2. What is the Hex number ’12’, in binary? To convert from hex to binary is easy! Just split the hex number into its individual digits and then convert those digits into nibbles. For example the 1 converts to 0001 and the 2 converts to 0010, then we join the answers to produce 00010010 (or simply 10010). What is the Hex number ‘2B’, in binary? For example the 2 converts to 0010 and the B (which is 11) converts to 1011, then we join the answers to produce 00101011 (or simply 101011). What is the binary number 01101100 in Hex? 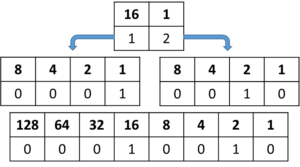 To convert from binary to hex is also easy! Just split the binary number into nibbles and then convert the nibbles into hex digits, then join the hex digits together to form the hexadecimal number. For example the 01101100 splits into the nibbles 0110 and 1100. 0110 converts to 6 (1 lot of 4 plus 1 lot of 2) and 1100 converts to 12 which is a C in hex (1 lot of 8 plus 1 lot of 4), then we join the digits together to produce 6C. Convert the Binary number 01011010 into Hex? For example the 01011010 splits into the nibbles 0101 and 1010. 0101 converts to 5 (1 lot of 4 plus 1 lot of 1) and 1010 converts to 10 which is a A in hex (1 lot of 8 plus 1 lot of 2), then we join the digits together to produce 5A. What is the greatest number that can be held in a single digit of Hex? There are 15 different hex digits, each representing the numbers from 1 to 15 (e.g. 1=1…..15=F). The greatest number held in a single digit of hex is therefore 15! What is the greatest number that can be held in two digits of Hex? The biggest number that can be represented with 2 digits of hex is FF. FF is 15 lots of 16 plus 15 lots of 1. This works out as 255. 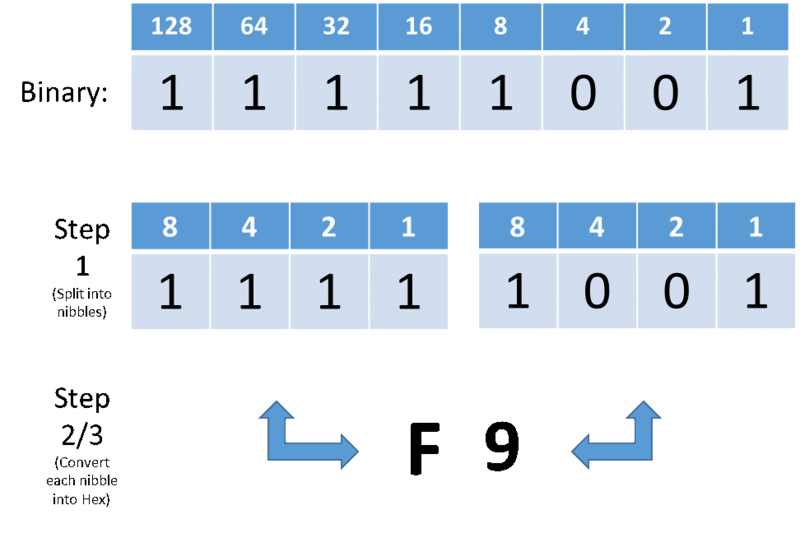 How many bits are required to store a single digit of Hex? The largest number that can be stored in a single digit of hex is 15 (which is F). 15 in hexadecimal is 1111 in binary. 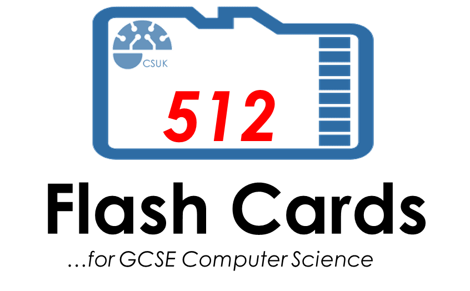 Therefore 4 digits are required to store a single hex digit.